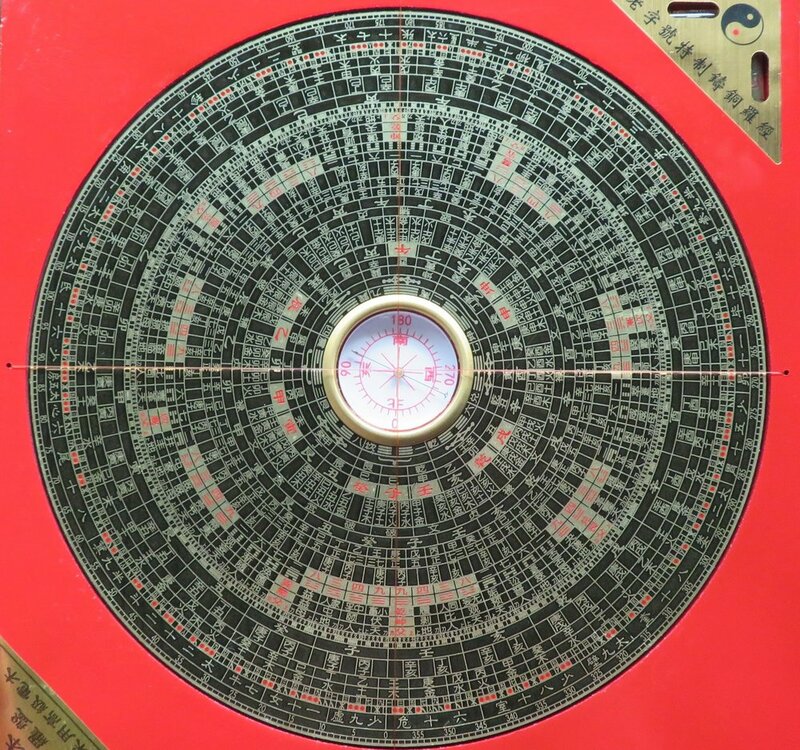 The Lo Pan, or a Feng Shui compass, can be complicated and mysterious. 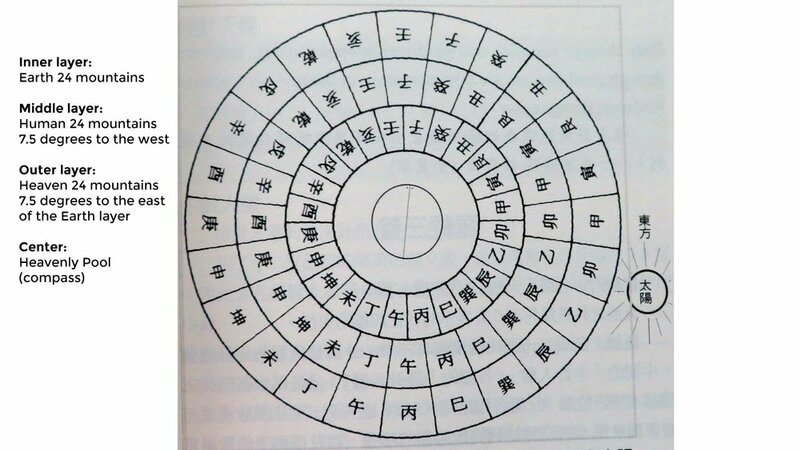 We are going to show you the basics of a Feng Shui compass, including the componants and the basic layers. It consists of a magnetic compass indicating the north-south line, layers of Feng Shui related information and degrees, and the outer square plate. Some of them have a level to keep the plate horizontal so the reading is accurate. It can be made of metal, wood, and plastic, usually a combination of the three. It needs to be kept away from any metal or electronics to reduce any interference of the magnetic needle. The layers can be very simple or very complicated. Some might have more than 30 to 40 layers. It is like a cheat sheet for a Feng Shui practitioner. Each layer has certain information based on different schools or systems of the Feng Shui. There are 2 basic schools of Feng Shui: San He and San Yuan. Some Lo-Pan has San He info, and some have San Yuan info. There is also a type with a combination of the above 2 schools. Many practitioners have their own habits of using certain Feng Shui systems and create their own Feng Shui compass. There is no right or wrong way of choosing a Feng Shui Lo Pan. It all depends on what styles of Feng Shui you practice. In the center, the compass with a magnetic needle is called “heavenly pool” or Tian Chi. It defines the north and south direction. When we turn the compass to match the north-south direction, all layers of information will be turned to the right place. There are 3 basic layers in a Feng Shui Lo Pan: the Earthly layer near the center, the Human layer in the middle, and the Heaven layer near the outside. Each layer consists of 24 mountains or 24 directions. The 24 mountains have Yin or Yang property. It is usually indicated by the color of the letter. The red is Yang mountain and the black is Yin mountain. The Earthly layer is for checking the sitting and facing directions of the house, like a regular compass. The degree we measure from the compass is the exact degree on the earthly layer. The Human layer is 7.5 degrees off from the Earthly layer. It is used to locate the direction for mountain or higher structure. The Heavenly layer is 7.5 degrees off from the Earthly layer, in the opposite direction of the Human layer. This layer is for locating the direction of the water. The outer most layer is usually 360 degrees for identifying the exact direction. There are many other layers including the Ba Gua symbol, I-ching, Lo Shu number, 9 stars, 28 stars, and many other theories of the Chinese metaphysical art. Most practitioners don’t use all layers but it is good to have all the information at your fingertip. It will take a while to study all the different theories so we are not going into the deatils. Feng Shui Lo Pan can be a power cure against many different Sha Qi. Displaying a small Lo Pan can keep away negative Qi and protect the house because of all the auspicious symbols and numbers on the Lo Pan. Kind of like a Ba Gua mirror, but you can display it indoors safely.